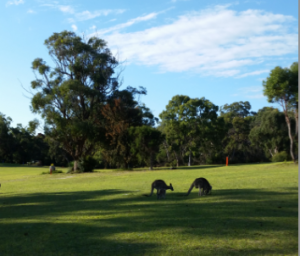 Kangaroos, and a host of birdlife, including the rare Glossy Black Cockatoos which have been seen regularly feeding on the course near the fourth green / fifth tee. North Stradbroke Island is located off the coast of South East Queensland and has been described by visitors as Noosa and Byron Bay rolled into one! There are miles of soft white sand beaches, perched lakes, gorges, dunes, untamed bushland and scenic cliff tops where you could very well spot whales enjoying the warm seas. If you haven’t been here before you are in for a real treat that will leave you yearning to return. Dunwich, a quiet port town on the the western side of the island, is where the ferries and water taxes arrive from the mainland berth. Dunwich has a population of about 883 people and was formerly known as Green Point when it was first settled in 1827 as a military post and pilot station. This beautiful little gem is rich with history and natural wildlife. Heritage sites include the Dunwich Cemetery, Dunwich Public Reserve and the St Mark’s Anglican Church & Public Hall. Amity Point is a sleepy fishing village located on the island across from Moreton Island and is approximately 20 min by car from Dunwich. A great area for camping, Amity Point offers cabins for tourists to hire that are directly in the middle of the beautiful native bushland where there are a number of walking trails and lakes to take advantage of in addition to the village’s spas, markets, museum, art gallery and of course our very own NSI Golf Club. The most popular township for tourits and local visitors, Point Lookout is located on the island’s Eastern side and is approximately 20 min by car from Dunwich. Point Lookout’s beaches are perfect for paddle-boarding, surfing and other water sports and are not far from the local cafes & restaurants for a bite to eat throughout the day. The trip on the vehicle ferry takes approx. 45 minutes on either the Big Red Cat or Stradbroke Ferries. These companies have recently merged, so there is no price difference. The return fare for a standard car/4wd varies can be up to $170 return (special deals can reduce this to $100. Check with Stradbroke Ferries). Tip: You don’t need to pay per person, you only pay per vehicle so travel in groups if possible to save on fare. The trip on the water taxi is approx. 20 minutes. Being large vessels, the ride is usually smooth although this is dependent on weather. Water taxis leave from Cleveland through the gold cat flyer terminal or the Stradbroke Ferries Terminal. A return fare is around $20 per adult and you can pay on arrival – they have EFTPOS facilities available on board. Please be aware that the Gold Cat Flyer docks at One Mile, while the Stradbroke Ferries Water Taxi docks at Dunwich. Free Ferry terminal pick up and drop off for mainland golfers. The Straddie Golf Club is located 10 minutes by car east of Dunwich. Call the Club on 07 3409 9999 to arrange your free transfers from the ferry terminals to the Golf Club when you come over to play. Call the day before your arrival to arrange your free transfer. If you are taking your own vehicle, you will need to book a vehicular ferry in advance. A bus service operates in time with ferries. This bus service picks you up from the ferry terminal at One Mile or Dunwich and takes you all the way to Point Lookout. A taxi service is available by phoning 0408 193 685. This taxi is a maxi van that can take up to 10 passengers. It is best to pre-book to ensure a timely arrival at your destination as sometimes the taxi will finish in the early evening if the island is not busy. The cost of the taxi fare from Dunwich to the North Stradbroke Island Golf Club is $25 for groups up to 5 persons (minimum $5.00 per head) and $40 for groups from 6 to 10 persons (minimum $ 4.00 per head).